Update 01/17/2019: Though Apple’s new battery cases feature a lower mAh rating when compared to previous versions, The Wirecutter reports that the company is using two battery cells wired in a series, resulting in the net amperage being the same but the voltage being boosted to 8.7V. This is significantly higher than the 2.8V featured in older iPhone Smart Battery Cases. The Wirecutter says that this means that the new Smart Battery Cases are actually more powerful than previous versions of the case. Check out the complete breakdown The Wirecutter has put together regarding the iPhone XS’ Smart Battery case. While Apple’s iPhone XS, XS Max and XR Smart Battery Cases were revealed yesterday, the exact size of the battery included in the new line of cases unsurprisingly wasn’t clear. Though Apple often discusses the minutia of technical specs related to its proprietary processors and camera technology, specific battery size isn’t a topic the tech giant places emphasis on. According to The Wirecutter’s Nick Guy (@thenickguy), who already got his hands on an iPhone XS version of the Smart Battery Case, the accessory’s battery measures in at 1,369mAh. Strangely, the iPhone XS Max version of the case also features a 1,369mAh battery, despite being significantly larger. This number is significantly less than the 2,365mAh featured in the iPhone 7’s Smart Battery Case. The older iPhone 6s Battery Case came in at 1,877mAh. It’s still unclear what the capacity of the new iPhone XR’s Smart Battery case is, though the number is likely the same as the iPhone XS and iPhone XS Max cases. Guy goes on to state that the iPhone XS and XS Max’s Smart Battery Case is roughly the same size as previous versions of the case. It’s possible that the inclusion of Qi wireless charging could be the reason for the new Smart Battery Case’s lower capacity. 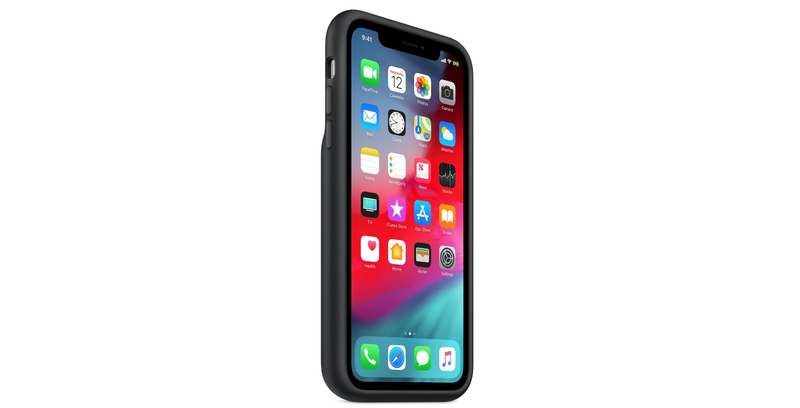 It’s also still unclear if the iPhone XS Battery Case will work well with the iPhone X given the difference in speaker holes between both phones as well as slight variations in the camera bump’s location. We’ll have more on Apple’s new iPhone XS and XR Smart Battery Cases in the coming days. Update 01/16/2018 4:22pm ET: According to The Verge as well as Rene Ritchie, the iPhone X does indeed work with the iPhone XS’ Smart Battery Case. All you need to do is swipe passed the incompatibility pop-up. Update 01/16/2018 1:37pm ET: According to MobileNation’s Rene Ritchie, Apple’s iPhone XS Smart Battery Case is not compatible with the iPhone X. As usual, Apple .com was/is correct. iPhone XS Smart Battery Case DOES NOT WORK with iPhone X. Camera fits but not tight, speaker/mic holes aren’t aligned, charging system throws up a compatibility error.